Welcome to our Working Goat website! What is a Working Goat? A goat that has a job. It could be a goat that pulls a wagon or cart. 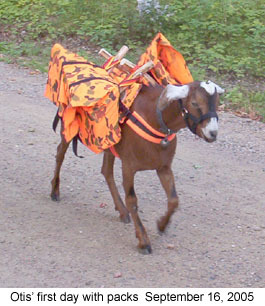 A goat that carries a backpack, is a pack goat/packgoat or goat that packs, with camping supplies or items just for a day trip. Maybe the goat visits Hospitals, Old Folks Homes or such as a Therapy Animal. The goat that does tricks or other tasks. Or a Show Ring Goat, 4H Project, many running/enjoying or manipulating an Agility or Obstacle Course. Maybe this working goat grows a long coat for it's owner to spin or that the owner milks, or gets milk from, once or twice each day. Our goal is to encourage you to work with and spend time with that wonderful animal out in your yard/field/pen. Goats are wonderfully intelligent animals that deserve much more of your time then most receive. We also hope to guide you toward the correct way of training and interacting with a goat. Training goats is not rocket science. They learn quick and love to be with you pleasing you. Goats can a do make great companion animals that excel at Therapy animals. Goats visiting Old Folks Homes can be more fun then taking a dog. The more your goat can do, pack, pull, tricks, the more likely you will be invited to preform. Most people are so glad to see what they remember as a farm animal that they may have had when they were younger. Some goat "gigs" even pay. But plan on volunteering your time. Word of mouth is going to be your best selling points for getting those paying jobs with your animals. Any breed of goat, or mix there, of can be a Working Goat. Of course the smaller breeds, such as Nigerian Dwarf (Dwarves), Pygmys, Kinder and the like, will not be able to pull the bigger carts and or wagons or pull or carry as much weight in a pack/panniers. Nubian's, I have been told, can be a bit, well, like Royalty, don't want to work and will, many of them, fuss about it. Saanan's can be seen from a further distance so trail visibility is better then say a light brown that might be camouflaged. A goat that looks like a deer or antelope in Hunting Season, can be a very big risk. 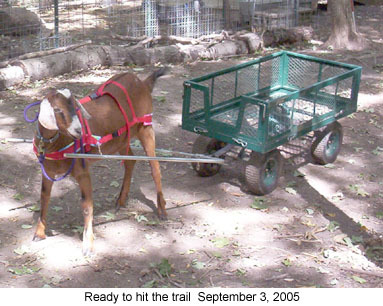 But any goat can be trained to pull, some, as individuals will be better or easier to train then others. If you have a goat that does look like a deer or antelope, please put orange on the goat while out on the trail (you should always wear orange when out during hunting season too). 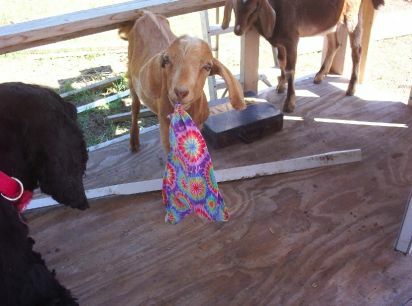 Make your goat very visible. 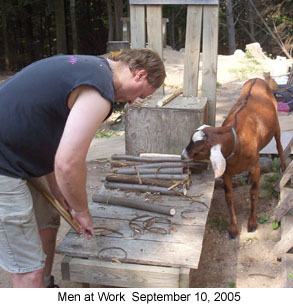 Some goats, like in this photo of Deron and Otis making Goat Sawbuck Saddles, think that their help is needed with all kinds of work. Sometimes when goats are annoying you, when they are in the middle of everything, or up on it, it is just time to take a deep breath and train. Esau and Amos were out "helping" Deron build a shed. They were picking up and moving all of his tools, tying to get up on the ladder with Deron and just generally "helping" <read being a big pain and really in the way of things>. So I went out with a chair and a bandanna and started training the Bandanna Trick....the two did very well. The biggest part of owning/training/having working goats is the training and what we call, "spending time". Sending time means, taking the time to be with them, to train them, to give them treats and pets and verbal approval. I am asked often about using goats to mow lawns or keep areas clear of weeds and brush. Well, any breed including Alpine, Toggenburg, Boer, Angora, Cashgora, Cashmeres, Mini Nubians or any other goat breed you can think of or mix there of can help you out with that. 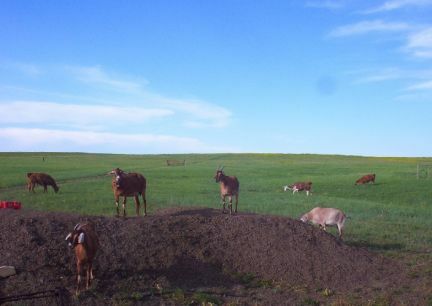 Just know that goats, like any person or other animals, are going to eat the good stuff first, so don't think they will come in and eat just weeds and junk brush. Many people think that goats will eat anything....guess what? Goats are among the pickiest of eaters! Goats can and do make great brush removal animal with low impact to the area. Just research the type of brush/bushes. The goats and llamas in this photo, as well as all the goats on this site, belong to Deron and I. This photo was taken right outside our front door. Goat Obstacle Courses are a popular and well attended event at a County Fair and or 4H event. Nothing says, and by all means you should, practice at home before entering the event. You do not need fancy Goat/Dog Agility Equipment to train your goat to enjoy the course. 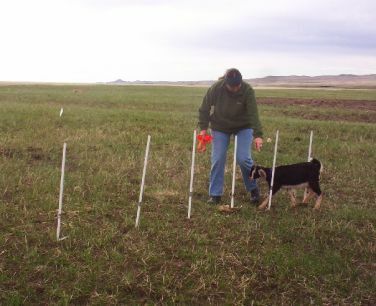 An old stump, a tarp or even a piece of tarp for the goat to walk over and or under, a 2" x 4" scrap laid out on the ground, fence posts, and on and on can be used to work with the goat. But I will tell you this, we have found that once you start working with your goat on agility equipment and see how quickly the goat learns and how much it loves the course, you will want more and better "stuff". I, personally, am hoping that Goat Agility catches on. It is really fun for goats, owners and spectators. I have trained dogs, rats, mice, hamsters, gerbils, a guinea pig (see our sister sites) as well as goats. I find that goats are very easy not only to teach each piece of the course, but the course as a whole....ours love it! And if you are curious about Moon Spots on Goats we have a page for that too. 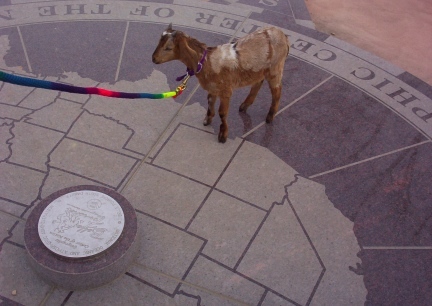 You can find Moon Spots on all types of goats and on goats all over the world, the one in this photo is at the Center of the USA Nation. To see more photos of goats with and to read about Moon Spots click here moonspots. THIS SITE IS A WORK IN PROGRESS, PLEASE CHECK BACK FROM TIME TO TIME TO SEE WHAT WE HAVE OR MIGHT HAVE ADDED. ALL WRITTEN MATERIALS ARE FROM MY OWN PERSONAL LIFE AND OR EXPERIENCES AND ARE COPYRIGHTED AS WELL AS THE PHOTOS. THANK YOU. Please visit often as this site, as well as www.workingllamas.com and www.marnasmenagerie.com, are under construction. Thanks for your visit! WE NOW HOST A GROUP AT MYSPACE CALLED "WORKING GOATS". 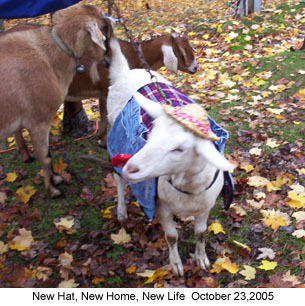 IF YOU ARE A MYSPACE MEMBER COME JOIN US AND CHAT ABOUT YOUR FAVORITE (or any goat topics) GOATS. We are continually working on this website. We are hoping to be working on expanding our working goat pages, as with our other site, this one is a work in progress. but rather to skid in broadside, thoroughly used up, totally worn out, and loudly proclaiming-----WOW--What a ride!"